Our household runs 100% thanks to the Dave Ramsey envelope system for budgeting. We have roughly nine envelopes for every single category of our spending, and we swear by it. If we don’t have the cash, we don’t make the purchase… a pain in the crotch (can you imagine having a pain in your crotch? So much worse than your backside, if you ask me) to cashiers, but a true heroic effort by the customers. After five days at the beach we were behind on our household purchases on Wednesday. I love making lunchtime errand runs, so I planned to stop by Target for necessary household purchases then swing over to Trader Joe’s for a quick grocery hit. As it happened I was running late on my way out the door yesterday morning. As I reached the front of our neighborhood I realized that I’d left behind my tub of overnight oats and my cash envelopes. I debated what to do and seriously considered just letting it go and swiping the ole plastic (doesn’t that sound like something a dad… or I… would use instead of referring to sexual relations? Because I probably will from now on) for my goods. But, it would be going against our system, and I’m nothing if not a rule follower. So. Around I turned to gather my breakfast, the Toiletries ‘velope and the Groceries ‘velope. At this point 8 minutes behind schedule. Whereupon I realized that my gas light was shining it’s bright petrol beacon at me. However, I’d left behind the Gas envelope. Now 12 minutes behind, I pulled into the gas station, shuffled some bills from the Grocery stash, fueled my car and arrived at work a stout 15 minutes late. But, I followed our budget. Which I meant I got to grocery shop. Which meant that I could go home and prepare salmon tacos on Trader Joe’s corn + wheat tortillas (have you tried these? As a whole wheat flour tortilla kind of girl, I could seriously make the switch to corn with these puppies) for dinner. Alongside those pockets of seafood goodness I served this hash. And now I’m eating it for lunch atop this staple casserole, and it is all very good. In a small dutch oven or large high-sided skillet, heat coconut oil. Once completely melted, add diced sweet potato, stirring occasionally. 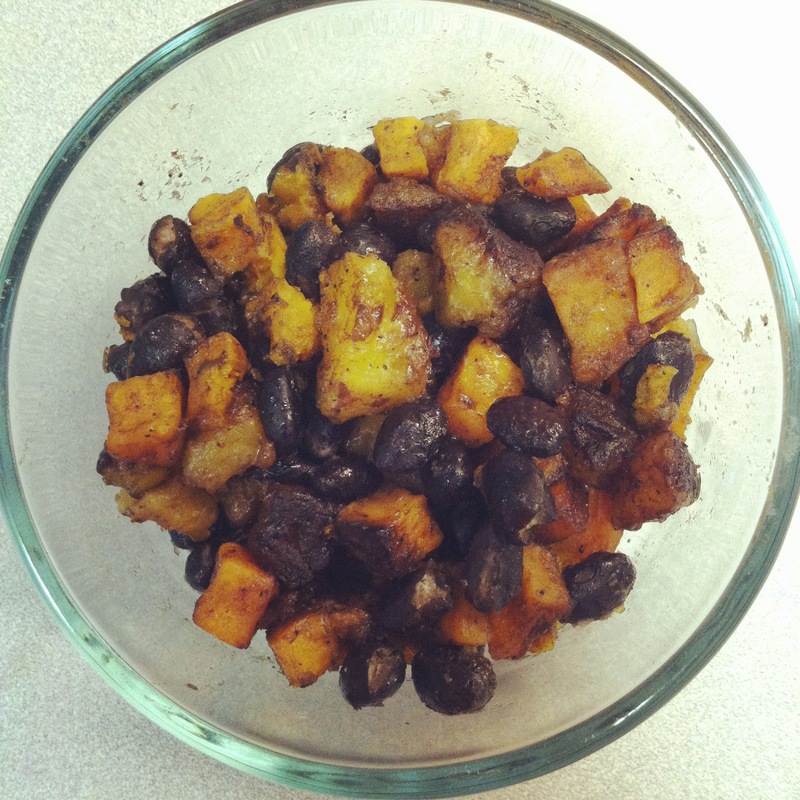 Once sweet potato has cooked nearly all the way through and begun to caramelize on all sides, add diced plantains, stirring occasionally until plantain has carmelized on all sides, and sweet potato has softened. Season as desired with sea salt, cumin and peppers (if desired) and stir until spices are equally distributed. Reduce heat to low, add black beans and cook until heated and liquid absorbed.